“to provide rich musical entertainment through the synergy of ancient Chinese tradition with youthful, diverse American culture; and 2) to promote classical and modern Chinese music”. Their dedication to taking on new works by contemporary composers in addition to traditional material is what sets them apart from other Chinese music ensembles. The organization’s co-founders, Hong Wang and Yangqin Zhao, have succeeded in bringing Chinese instruments out of obscurity and into the mainstream of Bay Area culture. 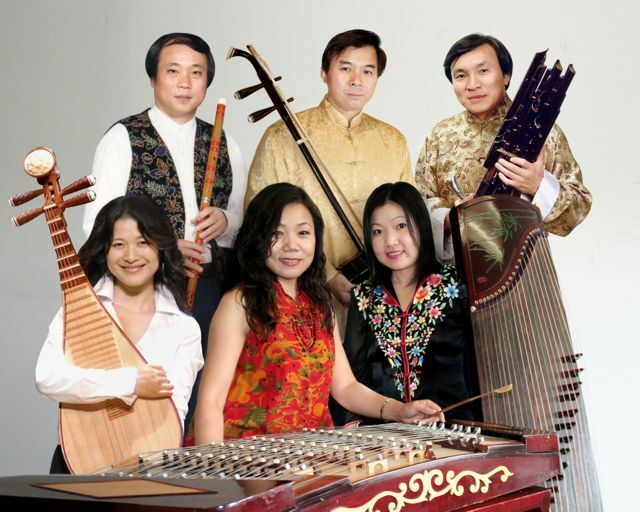 Melody of China’s instrumentation is comprised of Chinese traditional instruments including: yangqin (hammered dulcimer), guzheng (zither), erhu (2-string bowed fiddle), pipa (lute), sheng (mouth organ), dizi (bamboo flutes), Chinese percussion and other instruments. Melody of China artists include MoC Executive/Artistic Director Yangqin Zhao on yangqin, Gangqin Zhao on guzheng, Thomas Lee on erhu, Shenshen Zhang on pipa, Wanpeng Guo on sheng and Xian Lu on dizi. MoC artists often double on other instruments including Chinese wind instruments (in addition to dizi) and percussion. Described as “Innovative and Dazzling” by the San Francisco Chronicle, Melody of China performances have broken barriers in combining traditional Chinese music with contemporary works by influential composers such as Kui Dong, Gang Situ and Yuanlin Chen. Over the years, MoC has commissioned over 40 new works by 20 contemporary composers and has performed at numerous Bay Area schools and venues including Davies Hall, Herbst Theatre, Old First Church, UCSF, USF and others. Keeping one foot firmly planted in tradition, MoC has never shied away from taking on new and exciting projects, such as the concerts featuring Songs from Mongolia or the innovative Young Composers series, where young Bay Area composers are asked to compose music for Chinese instruments. MoC has been guest artists with the Berlin Philharmonic and the San Francisco Symphony. MoC has also performed at New York’s Lincoln Center and has performed in major U.S. cities on numerous occasions (including the Chicago World Music Festival, the Lotus Festival and the Chicago Jazz Festival). MoC has performed with jazz ensembles including Francis Wong’s Asian Improv arts and Anthony Brown’s Asian-American Jazz Orchestra. Being strongly tied to the local San Francisco Bay Area arts community, MoC has also accompanied several dance groups, including Alonzo King’s Lines Ballet and the Oakland Ballet. In 2009, MoC partnered with Lily Cai Dance to premiere a new dance/music work at the Henry Cowell Theatre. In 2010, MoC collaborated with saxophonist/composer Francis Wong to premiere Shanghai Story for Chinese instruments and jazz quartet. MoC commissioned Sohn for Qin and Chinese chamber ensemble by composer Gang Situ in 2011. In 2012, MoC premiered Along the River During the Qingming Festival by composer Joan Huang with guests Earplay ensemble at the San Francisco International Arts Festival in 2012. The ensemble celebrated 20 years in 2013 with a concert featuring guest artists erhu virtuoso Jiebing Chen and jazz pioneers Francis Wong, Jon Jang, Marcus Shelby and Deszon Claiborne. In addition to performances, Melody of China is dedicated to arts education and conducts numerous classes and workshops for all ages geared toward a greater appreciation for the beauty and versatility of Chinese instruments. MoC has contracted with SF Symphony’s Adventures in Music program (AIM) and Young Audiences for several years. In addition, MoC’s free after school program, where children learn to play a Chinese instrument of their choice, has been a huge success at Sunset Elementary School. Funded by the California Arts Council, the popular program is now in its seventh consecutive year.